I know what you are thinking, with all the amazing bulb plants out there, how have I managed to narrow it down to a hot list of just ten?? Well with some difficulty and a lot of bias I gave it a go. With its distinctive drooping top, narrow bell shaped flowers and sweet subtle perfume there is no competition between our native bluebell and its Spanish cousin. The Spanish variety can be aggressive and where it cross-pollinates in woodlands with our home breed we are slowly losing the original. 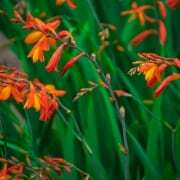 So not only by planting this beautifully poetic flower are you going to be able to bring a little bit of the forest floor to your garden, but you are encouraging a heritage of British planting. Flower in spring, plant bulb 8cm deep. There are so many amazing Allium varieties to choose from; with great towering characters to those with firework like spherical heads it is no wonder that Alliums will always be a summer time favourite and a friend to garden designers everywhere. 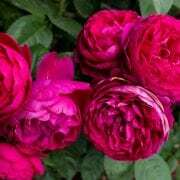 I have gone with one of the most popular ‘Purple Sensation’ as, standing at 1m in height, its bold dense flower head make a bold statement throughout summer. This is a reliable best seller which I would highly recommend. Flower throughout summer, stand 1m in height. Plant bulb 15cm deep. For an alternative to the bright yellow of the traditional daffodil, why not go for these spring flowering blooms? This petite variety of the daffodil produces creamy/white flowers that can be up to 6 on each stem and are delicately scented. An interesting way to bring the traditional into a contemporary scheme. Flower in spring, stand at 40cm in height. Plant bulb 10-15cm deep. These tiny blue flowers with a stripe of yellow through the centre are amongst the first to come out at the very end of winter going into spring. With light levels low and mornings looking grey, it is that striking blue that is the first thing the eye will see. Bold, beautiful and elegant these are a winner for any bulb planting scheme in my book. Flower late winter/early spring, stand at 25cm in height. Plant bulb 5cm deep. Hyacinths are a wonderful way to bring scent and colour into your garden early on in the year, they are also brilliant as pot plants. Any bulbs planted on mass or in groups make a spectacular show and hyacinths are no different, their impact is only amplified, particularly when attention is paid to colour groups, white and blue working well together. Flower from late winter to early spring, stand at 25cm in height. Plant bulb 10-15cm deep. With a variety of choices in flower size you can really get to precisely what you want with these little buds. I love the pure white of this variety and the way you can mix different sized varieties together to create a really natural looking swathe. Flowering in mid spring, stand at 10cm in height. Plant bulb 5cm deep. Now I have to say, this is where a bit of bias comes in to play as you may notice that three of these choices are in fact, tulips. However! Tulips can be useful in so many schemes whether they are traditional cottage or countryside gardens, or contemporary courtyards. Just imagine the look of black wet paving with bright yellow tulips rising up out of raised planters? This particular variety has delicate brushes of red/orange and green, making it look like the colours were painted onto white petals. For something a bit different that brings the tulip into the modern age why not give these beauties a go? Flowers mid spring, stand at 45cm in height. Plant bulb 10cm deep. There is something about the subtlety of the green wisps through white petals on these flowers that to me, makes them stand out from other choices. They bring a classy sense of elegance to the proceedings, daring you to say that the Tulip is out of date. Deep purple with frilly petals the is a prime example of the impact the parrot varieties of tulip can bring to a bulb planting scheme. A wonderful deviation from the traditional tulip shape, it had to be included in our top ten. Flowering mid spring, stand at 55cm in height. 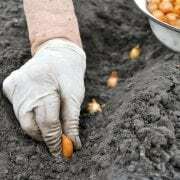 Plant bulb 10cm deep. Last but by no means least these little flowers bring a delicate sense of the ephemeral to your garden. This particular variety produce drooping heart shaped flowers which when planted in groups produce a blanket of white early in the year. These are one of the bulbs that we wait for by the window as winter draws lowly to an end, for the first signs of spring and the garden begins to wake form its dormant slumber. Flowering late winter early spring, stand at 15cm in height. Plant bulb 5cm deep.